Stalin had advised Mao to be patient, but patience was a quality that he himself lacked. Had the USSR waited and feigned cooperation in the rebuilding efforts, a weary United States would have withdrawn and the Communists could have taken over. Instead Stalin decided to humiliate the United States, to demonstrate its impotence in international affairs and take it off the board with the Berlin Blockade. The Marshall Plan would fail, the Allies would be pushed out of Germany and then the emboldened Communists would push further west. The Berlin Blockade was a siege in all but name. Beyond the sheer fact of food and coal being cut off to a city of millions were a thousand minor humiliations by Soviet officials designed to break the will of their enemies to resist. That was their mistake. And it’s a mistake that the left often makes. The barricades around the Lincoln Memorial and the WW2 Memorial, the traffic cones blocking the view of Mt. Rushmore and the sawhorses around Old Faithful are no Berlin Blockade, but they come out of the same meanness of spirit and the same motives. The petty harassment extended to a 24-hour blockade of an inn that had tried to stay open and rangers arriving to block Old Faithful every time it erupted. There are few moments that sum up the meanness of spirit of the Obama Blockade as well as a park ranger angrily telling senior citizens to get back on the bus and stop taking photos because they are engaging in forbidden “recreating”. The Obama Blockade has no valid justification. Like the Berlin Blockade, it is about power and control. 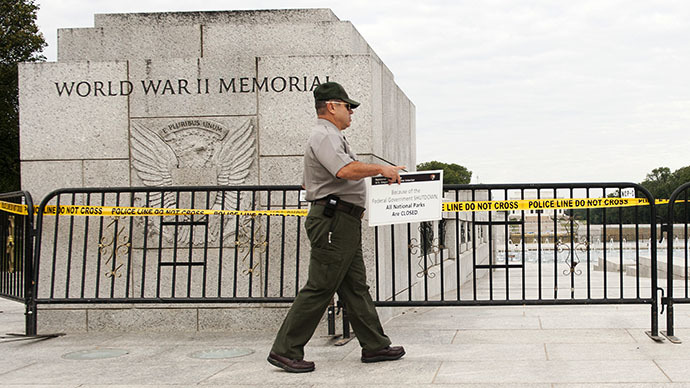 No one actually has to go to the Lincoln Memorial or the WW2 Memorial or any of the other national monuments that were closed off. They are places that Americans assumed they could always go because they were part of their national heritage. It never occurred to them that they would be shut down. The Pisgah Inn, the Cliff House, the Claude Moore Colonial Farm or any of the other private non-profits or restaurants on Federal land run themselves. It takes more resources to shut them down, to blockade them, than it would to let them keep on operating. But it’s not about what’s easier. The Communists picked a fight over Germany’s future currency. The current fight is over ObamaCare. But ObamaCare, like the Communist Ostmark, is about more than its substance-it’s also about control. The siege of America, unlike the siege of Berlin, is virtual; but it also depends on seizing control over the distribution of vital necessities. In Berlin, that meant food and coal. In America, that’s health care. The question is will you agree to ObamaCare, just as in Berlin the question was whether you would get a Soviet ration card, fill your wallet with Ostmarks and submit to a Soviet takeover with their Communist puppets. The Communists assumed that cutting off food would force the residents of Berlin to use Soviet ration cards and currency. The residents were able to see that short term food from the USSR would mean decades of little food under Communist rule. Similarly any temporary benefits from ObamaCare will mean national shortages of health care in the future. The National Park Service’s abusive antics, which include kicking senior citizens out of their cabins and detaining others at a hotel under armed guard and with warnings not to step outside, are about power. For these same reasons, Soviet officials subjected trains and water freight to pointless inspections, made petty demands and resorted to buzzing the Allied aircraft carrying out the Berlin Airlift. The tactics may have been petty, but they were making a big statement; this is our territory. We are in control here. The petty harassments of officialdom all make the same statement. The power to make people jump through hoops, to do unnecessary and useless things, to accept indignities and tolerate harassment are a demonstration that the power lies on the other side of the desk. It’s not a tactic unique to the left, but the left really thrives on it. The Obama Blockade can shut down websites that go on running anyway, it can refuse to pay death gratuities, take down the Amber Alert and harass tourists, but it can’t do what it would really like to punish the Americans who, like the Berliners, insist on voting to the right of the left, by taking away anything more vital. And that is what this battle is really about. The petty harassment of the Obama Blockade is a sign of impotence. It must satisfy its spite harassing individuals, throwing out senior citizens from their homes and denying the families of soldiers killed in its botched war money to help pay for their funeral expenses, because it can’t inflict a greater misery and torment on the country at large. And it can’t do that until it completely controls health care. The Berlin Blockade signaled that even with the numbers on their side, the Soviet Union did not dare roll the dice and fight the Allies over the spoils of war. The Obama Blockade is not a sign of strength, pettiness never is, it’s a sign of weakness. Like the Soviets, Obama is hoping to rattle Republicans into backing down and giving in. He’s hoping that the accumulation of inconveniences, troubles and deprivations will turn Americans against the Yankee Running Dog Capitalists of the Republican Party, the way that the Communists hoped that being cold and hungry would turn Berliners against the United States. 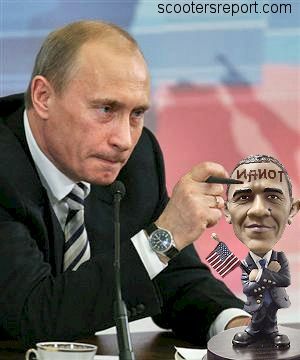 Stalin lost his gamble and Obama is being forced to reconsider his. Instead of the easy victory he hoped for, his blockade created a backlash. The photos of WW2 veterans storming the WW2 memorial have echoes of the Berlin Airlift; a seemingly small action whose greater resonances attain heroic proportions by pushing back against tyranny. Family restaurants that defy the blockaders and fight to stay open send a message that there still is room for private lives and private concerns even on government land. The Soviet Union hoped that Berliners would turn to the Communists. Instead they turned against them. Obama’s own approval ratings have fallen sharply. The speeches and putdowns roaring at record pace out of the White House have not changed the basic fact that Obama’s position, like that of the USSR, is that he will not negotiate over an economic power that he considers to be absolutely his in every way. The tactics of the Communists shook Americans of their complacency. Even those who had thought that Stalin was a reasonable man willing to be our partner understood that there could be no middle ground. The Soviet Union was not looking for a compromise. It wanted everything and if it didn’t get it, it would make life as miserable as it could for everyone. That has been Obama’s message. Either Congress completely capitulates and recognizes his power to do whatever he likes or memorials will be shut down, senior citizens will be thrown out of their homes and the families of the soldiers killed in the line of duty will have to struggle to cover funeral expenses. The Berlin Blockade woke up Americans to what the Soviet Union really was. The Obama Blockade is waking up Americans affected by it to what Obama really is. Behind the big ideas and the big speeches is a meanness and smallness of spirit that desires power above all else, that lacks any sense of decency and honor, and that when denied, lashes out viciously against anyone in the grip of its power. r.
The Berlin Blockade showed millions of people why they never wanted to find themselves under Communist control. It ended what might have become a recurrence of isolationism and firmed the conviction of Americans that the only way to deal with the Soviet Union was to push it back. The Obama Blockade, the meanness and pettiness in its needless power plays, is a warning of what life will be like if the left gains even more control over America. Family Security Matters contributing editor Daniel Greenfield is a blogger, columnist and freelance photographer born in Israel, who maintains his own blog, Sultan Knish.